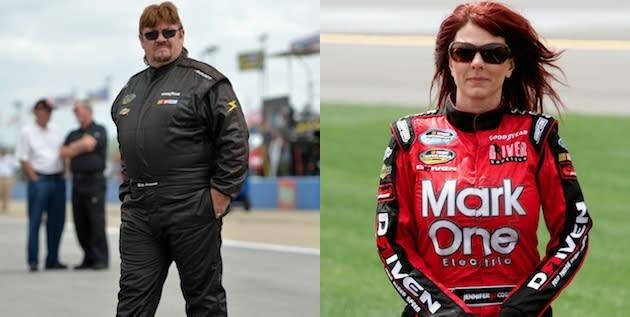 NASCAR driver Mike Harmon is out on bond after a warrant was issued for his arrest in connection with stealing Jennifer Jo Cobb's race hauler on May 11. Yes, this is a tale involving two NASCAR drivers, and one is accused of stealing the other's hauler. Cobb, who is competing in the Camping World Truck Series this year for her own Jennifer Jo Cobb Racing team, said that her hauler was stolen on May 11. The Rowan County, (N.C.) Sheriff's Office issued warrants for the arrest of Harmon and his sister Sheila Rae Rice on Wednesday for felony larceny of the trailer and breaking and entering of a motor vehicle. Harmon was Cobb's team manager when she previously ran in the Nationwide Series. Harmon, who also has his own team, has made five Nationwide Series starts and two Truck Series starts this year. Harmon was arrested Wednesday afternoon and posted bond. He took to Twitter Wednesday evening to profess his innocence, saying in two tweets that "I want it known that I have never stolen so much as a piece of bubble gum in my life. I did not take JJC hauler, there is no video of me any where near her shop. Today she was the windshield & I was the bug, but when we get in FEDERAL court in a couple wks there's a boulder coming." Cobb posted to Facebook Thursday morning that, contradictory to Wednesday reports, she did not accuse Harmon of stealing her hauler, but that the warrant was issued because of "evidence and eye witness accounts." Video posted on the WBTV.com YouTube account shows Cobb's trailer slowly driving away from the camera, but there's no way to tell who is behind the wheel of the truck or how they entered. Cobb said the contents of the hauler were valued at over $250,000. This isn't the first time this year that a vehicle has been at the center of a disagreement between Cobb and someone formerly involved with her team. During Speedweeks at Daytona, the van that Cobb's team drove to a restaurant was taken when it was parked in the lot. Cobb initially reported the van as stolen, but shortly after its disappearance, David Novak contacted the Ponce Inlet Police Department and said he was the owner of the vehicle. Novak, who according to the Daytona Beach News-Journal was in litigation with Cobb about the ownership of her team after he cut ties "personally and professionally" with Cobb in December, told police that he was the van's owner and supplied proof.